Raven Tree Press, 9781934960622, 32pp. Hugo's mamNB sends him to the store to buy soap. Of course, Hugo takes the long way there which gets him into loads of trouble and plenty of mud. With all his adventures, he keeps forgetting what he's supposed to buy at the store. 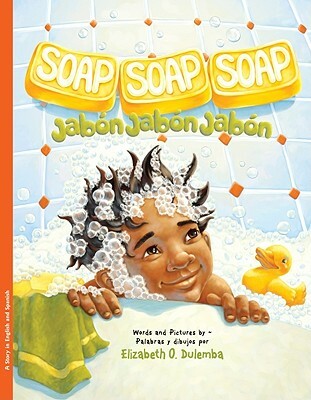 But through each mishap he's somehow reminded he needs soap, soap, soap jabon, jabon, jabon! Hugo ends up a muddy mess, but he finally prevails. He buys the soap and returns home only to discover that his mamNB plans to use the soap on him! Soap takes the classic Appalachian Jack Tale and gives it a modern twist. The story now takes place in a small rural town with a sweet little troublemaker named Hugo. The artwork is drawn with graphite and rendered digitally using bright, happy colors reminiscent of this playful tale. The story is presented in English text with embedded Spanish in rojo. The sprinkling of Spanish easily introduces key words using both story context and illustrations to aid in the fun and learning.